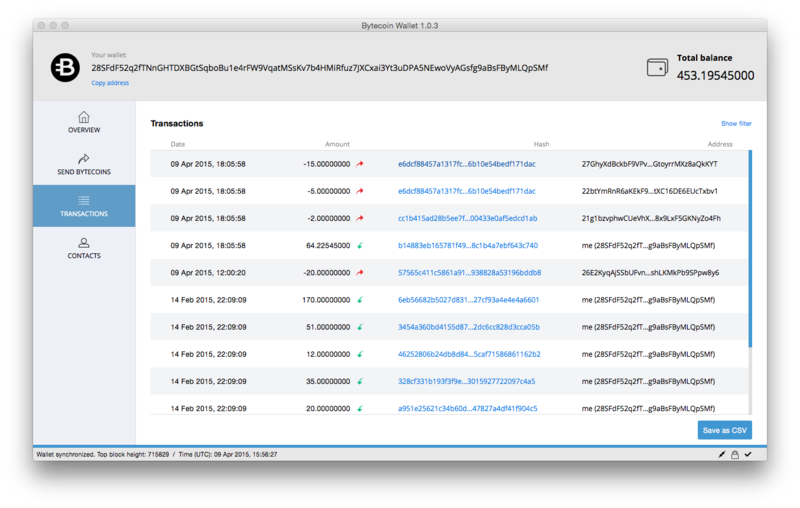 Today the Bytecoin team has released a fundamentally new GUI wallet, featuring modern design, intuitive interface, and high speed of operations in Bytecoin system. Bytecoin Wallet is available in versions for all major OS and allows new users to start working with Bytecoin swiftly. Bytecoin Wallet is the second part of Bytecoin v.1.0.3 release. Earlier this week Bytecoin Reference Client has been updated to introduce new high and low-level API. These APIs give smart access to Bytecoin engine and allow third party developers to focus on building their own applications and services according to their business requirements. Bytecoin Wallet and API libraries together represent an updated Bytecoin technology that allows both users and developers to shape and improve Bytecoin ecosystem, and take part in it in a simple and comfortable way. Share your thoughts with us! We invite you to download and test Bytecoin Wallet. Your feedback is valuable for us and will affect usability and upcoming features. The Overview tab is the first thing you see when you launch Bytecoin Wallet. We've tried to make this screen both informative and simple. Overview is going to be updated with further releases when more Bytecon features are implemented. Its purpose is to provide you with a quick insight into your recent financial operations. With Bytecoin Wallet release we've rethought the way we indicate the balance. We believe this to be more intuitive than it was originally implemented in simplewallet. * Available balance is the funds that are available for transactions. This change has been implemented in simplewallet too. With Bytecoin you are able to send money to various users with one transaction. You may add several recipients, but keep in mind that the transaction with a high number of addresses may get rejected due to being excessively large. The way CryptoNote transactions are visualized in Bytecoin Wallet makes sending money simple and unambigious. What's more, the wallet provides you with exact feedback in case there might be something wrong with the transaction. Please note that you are unable to send Bytecoin in case you're not synchronized with the network yet. The interface will get unlocked once your local blockchain is up-to-date. Transactions screen hosts the story of your financial operations. You may filter the table, check transactions info or export all data in CSV. Address book is a simple must-have for long CryptoNote addresses. Once you open Bytecoin Wallet, it will automatically create your first Bytecoin address and start synchronizing with the network. It is highly recommended that you encrypt your new Bytecoin wallet with a password. Leaving the wallet unprotected makes it vulnerable in case your system is compromised. 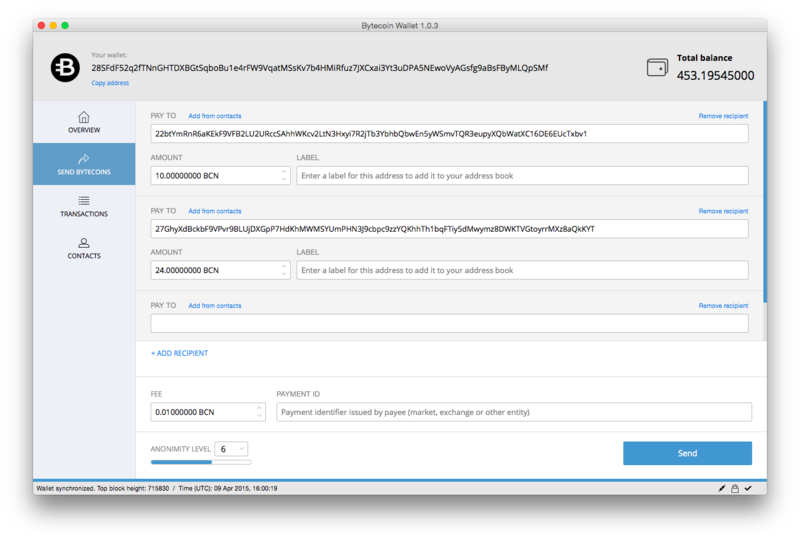 Unlike Bytecoin Reference Client, Bytecoin Wallet uses .wallet files instead of legacy .keys files to store your private keys for each wallet. 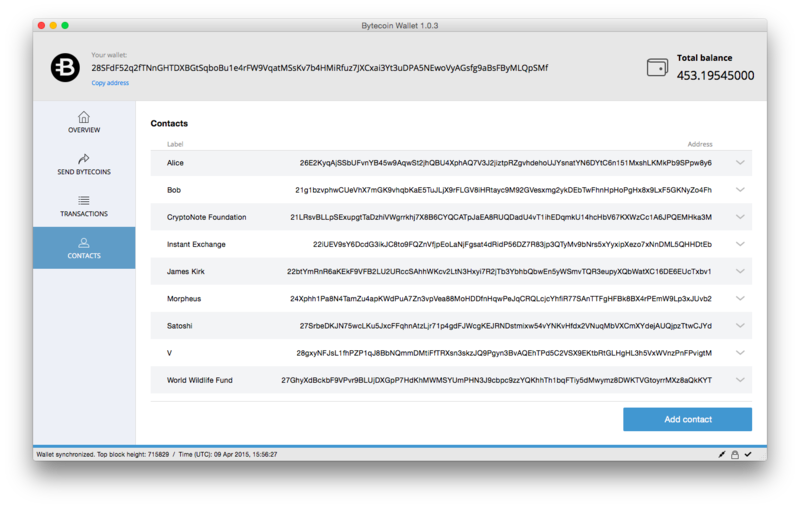 Bytecoin Wallet is able to import .keys files (with the existing password), but it will create a .wallet file for further operations. 1. bytecoinwallet.wallet – a default wallet keys file that is created on first startup of Bytecoin wallet and gives access to your fresh Bytecoin address. 2. bytecoinwallet.log – a log file for the node that is running inside Bytecoin Wallet.